Because time rushes so fast, it is easy to forget just how long it has been since bands last toured in support of an album. 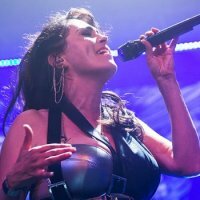 Within Temptation's 'Hydra' tour was in 2014 (not counting when they played Bloodstock in 2015), an incredible four years ago. That absence has obviously been felt among their fans, as when we arrived the queue stretched way past the end of the block and some, who were not at the front, had been in the queue since 1:30 that afternoon. And it had been raining for quite some time by then. Dedication, that is. Support for tonight was a US band called Ego Kill Talent, who played around thirty minutes. I was unfamiliar with their material, but I have to say I have seen a lot worse, and some of their stuff was quite good, although vocalist Jonathan Correa did tend to shout the words rather than sing in some of the songs. The audience seemed to like them though. So, onto the main deal, and I had arrived at the conclusion, while watching the first band, that this show wasn't going to be as big a production as the 'Hydra' tour, simply because there didn't seem to be much on stage. This was correct as, when they came on at 21:05, there were risers for the keyboards and drums, a main screen across the back of the stage, and two smaller ones just below the risers. 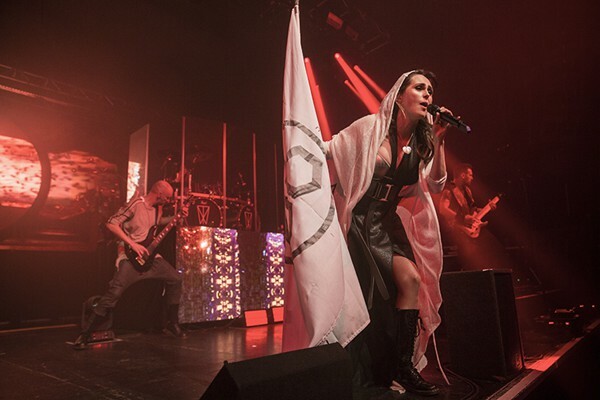 The show started with drummer Mike Coolen alone, before being joined by the rest of the band, with Sharon eventually arriving wielding a banner and wearing a white robe, with new designs that will no doubt soon be available on merchandise. And rather bravely, they started their set with three numbers from the, as yet unreleased, new album 'Resist.' 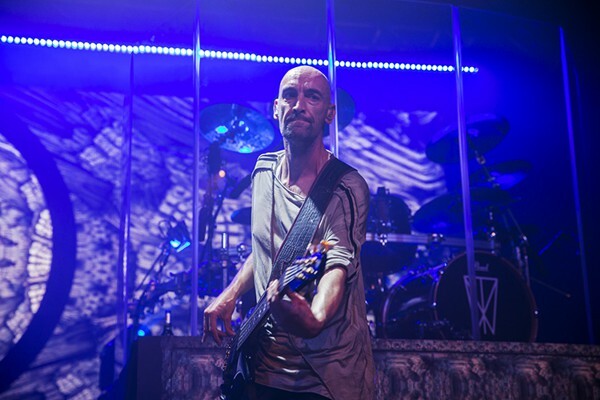 In fact, they were the first three songs from that; 'Raise Your Banner', 'The Reckoning' and 'Endless War', although they were played in a different order to what they are on the album. But it was obvious right from the start that tonight was going to be a breeze for them, and the audience was with them all the way. As you can imagine, the rest of the set was filled with crowd favourites, some of which Sharon urged them to sing along to, and they didn't need much persuasion. They are obviously happy with the new material, as they also played another two, namely 'Supernova' and 'Mercy Mirror'. Of course, nobody sang to them, as nobody has heard them yet. There was an excellent version of 'Forgiven' with just Sharon and keyboard player Martin Spierenburg, before they ended the main set with 'Mother Earth' which everybody loved, and they came back a couple of minutes later with Sharon saying, "You didn't think we weren't coming back did you?" It's very unusual, and brave, to tour an album that has yet to be released, and also to play so much music on that tour that nobody knows, but these guys did it with no problem whatsoever. I have to admit that I was surprised they played here as I thought they would do somewhere bigger, probably even the Hippodrome which was just over the road. Although it was larger than I expected it to be, I wonder how much longer fans will be able to see them out of larger theatres or arenas. This venue sold out, as did the following night at Manchester, and that may be an indicator. Set list: Raise Your Banner, The Reckoning, Endless War, In The Middle Of The Night, Stand My Ground, All I Need, Supernova, Shot In The Dark, The Promise, Faster, Mercy Mirror, Paradise, The Heart Of Everything, Forgiven, Mother Earth. Encore: What Have You Done, Stairway To The Skies. Review and photos by Andy B.